Glasspoint joins the push to take solar thermal tech and make steam. 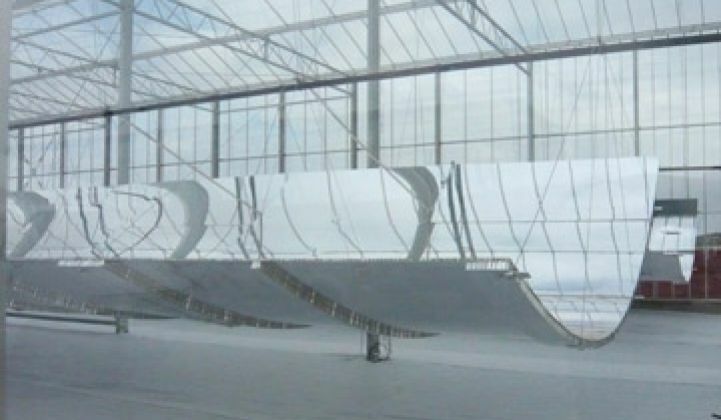 When it comes to solar thermal power plants, GlassPoint is trying to think small. BrightSource Energy is building a similar one for investor Chevron and Areva Solar has touted the benefits of solar steam in the past, too. The concept is straightforward: reflective surfaces help concentrate the sun’s heat, which then gets exploited to produce steam. Solar thermal power plants produce steam as well, but they have to operate on a larger scale: BrightSource’s Ivanpah plant will produce 370 megawatts when built. Ivanpah and other large-scale plants, however, have drawn lawsuits and objections from environmental groups. Thermal power plants are also facing dire competition from ones based on solar panels. Hence, steam may be the way to go. During peak conditions, an acre of land will produce about 90 barrels of steam cheaper than the steam can be produced from gas. Gas is the largest component of any EOR operation and the solar unit will deliver energy for less than $3 per million BTUs. ”We are not going to oil companies saying, ‘This will save the planet.’ We say, ‘It would have helped you save the money.’ That’s a much more compelling proposition.” He also stressed that the construction was completed in just six weeks.